A small city block in the centre of Winnipeg—the 2.4-acre-sized Market Lands—has long been a central (if in some senses marginalized) urban space. Its future is the subject of an international design competition that has attracted some of Canada’s best design talent. 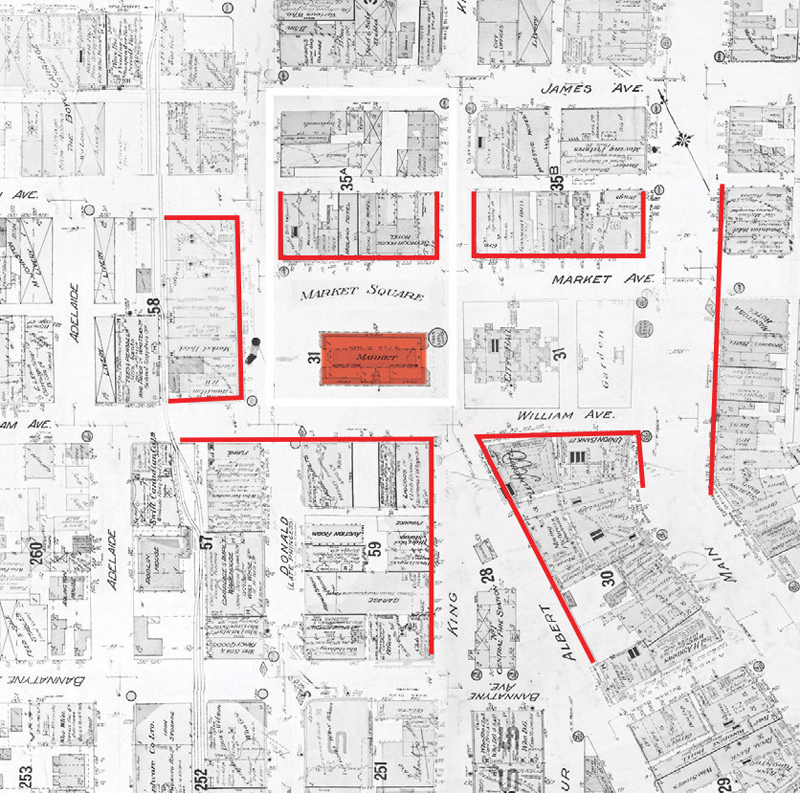 When the site was acquired by the city in 1875 for use as a civic market, its deed stipulated that part of the block should remain “in public use” in perpetuity. This mandated civic role meant it was to play a part in the dramas that shaped the urban character of Winnipeg over the next 150 years. Because of its proximity to City Hall, the market was a site of political protest, including for the Winnipeg General Strike of 1919. Eventually, the need for a central civic market waned, and in 1966 it was replaced by the Public Safety Building, part of a new, high-modernist-styled Civic Centre. 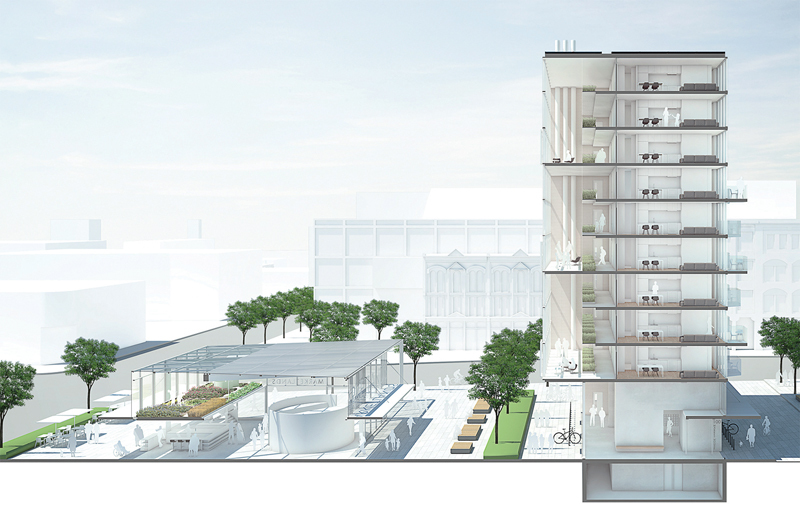 The Civic Centre was the first of many projects intended to structure and breathe life into a downtown from which life seemed to be dwindling. As the middle class moved out into burgeoning suburbs, downtown Winnipeg came to share the fate of city centres across North America: isolated and even feared. The Market Lands can be seen as a microcosm of that era of urban changes, its mandated “public use” shifting from commerce and politics to policing. Despite massive investments in the core area, it wasn’t until the turn of this century that the recovery of downtown Winnipeg began to gain traction. A key instigator of change was CentreVenture Development Corporation, established by the city in 1999 as an arm’s-length agency to catalyze development. 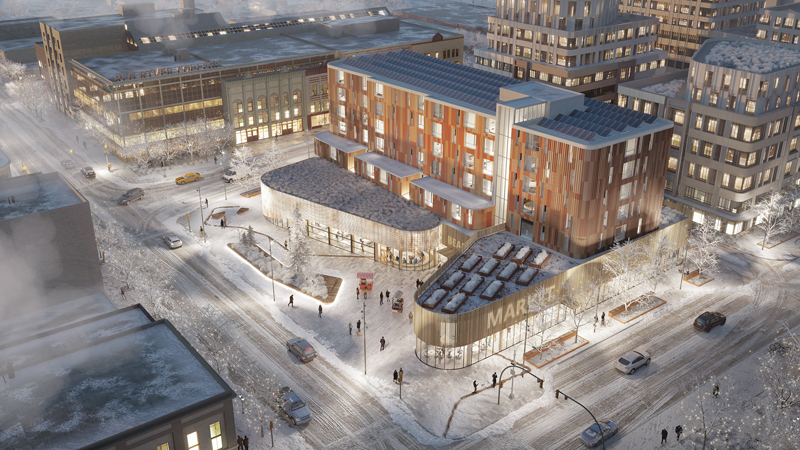 The Market Lands is one of numerous projects they are stick-handling from idea to reality. A debate raged in design circles over the future of the site. In 2013, the police made plans to move its headquarters from the Public Service Building, whose dolomitic limestone cladding had badly degraded. For Susan Algie, executive director of the Winnipeg Architecture Foundation, the structure was an excellent example of Brutalism with undeniable heritage value. To Brent Bellamy, MRAIC, creative director at Number TEN Architecture and chair of CentreVenture, this was outweighed by its role as “a boulder in the stream of pedestrian circulation”—a physical and symbolic barrier. According to Angela Mathieson, CentreVenture’s president and CEO, the key strikes against potential repurposing of the building were cost and accessibility. Designed in part for temporary incarceration and raised on a podium, it was hard to see how the building could be salvaged for public use. DTAH’s three main volumes frame a plaza and reinforce diagonal connections to the southeast. In light of the dominant snow, concrete and stone in the surroundings, the project’s colours and material palette were selected for visual warmth. The Daybreak Hall is a multi-purpose space with a firepit as a focus, and together with the proposed gallery of Indigenous art and the Market Hall, it frames a diagonal passage through to Market Street to the north. The first step in reimagining the site was a public engagement process, managed by Public City Architecture. An urban design framework identified “5 Big Moves”: connecting to the popular Old Market Square on the southeast; re-establishing east-west movement along the Market Avenue corridor on the north; strengthening movement to the north and west to encourage development in Chinatown; reinforcing urban edges; and focusing density toward the north. Public consultation generated a set of guiding aspirations including Belonging, Destination, Authenticity, Connectivity, and Innovation. According to Mathieson, the comprehensive program that was to drive this new urban space was itself aspirational. 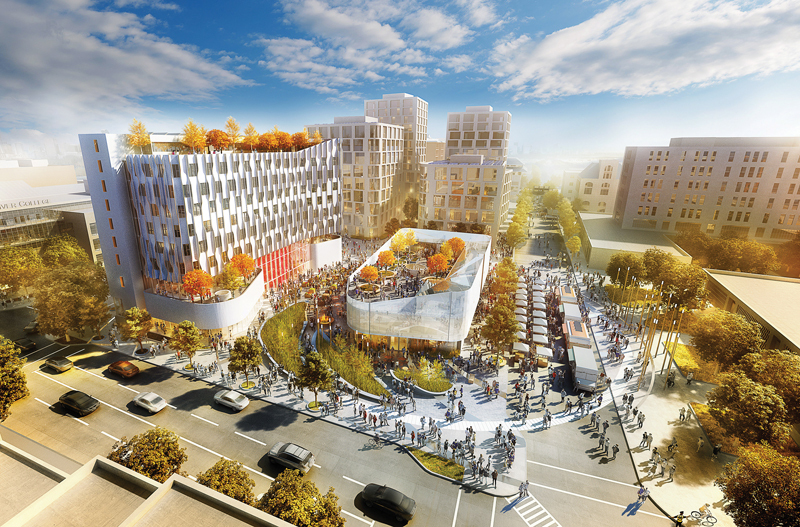 To ensure the “public use” required by the original deed, it envisaged a public market, outdoor public spaces and, in one mixed-use building, 100 units of affordable housing and a cultural hub. Innovation was demanded by the requirement to, on a modest budget, be net-zero energy and net-zero carbon ready, targeting LEED Platinum. The project was also intended to kick-start residential development planned for the northern two-thirds of the block. Twenty-three firms submitted qualifications under a two-stage process. Of the five finalists, only one was from Manitoba—1×1 architecture in partnership with the UK’s dRMM. This generated some controversy locally, but according to professional advisor Dudley Thompson, the intention of the competition was to see “bridges and links being made internationally.” Indeed, a number of the teams in the first round were composed of Manitoban firms with international partners, and initial inquiries came from 32 countries. In addition to addressing the detailed and prescriptive program, proposals had to make sense of a complex urban morphology. The Market Lands are located near the intersection of several urban grids. One of these is derived from the long-lot land-division employed by Métis farmers, running perpendicular to the Red River. Another is a cardinal grid established for downtown by English settlers and municipal government. Three thoroughfares complicate the situation: Main Street, running roughly north-south; Portage Avenue, running east-west; and Notre Dame Avenue, running from the northwest diagonally into Portage near its intersection with Main Street. 1×1 architecture and dRMM’s design is based on the agricultural grid of the Prairies, a key tool of colonization. They drew on the Anishinaabe notion of Aabijijinan, related to processes of movement and change, to distort that grid and implicitly criticize the motives behind it. An “eroded soft grid” forms the basis of the landscape at ground and roof levels, as well as the vertical plane of the mixed-use Market Hall residence. 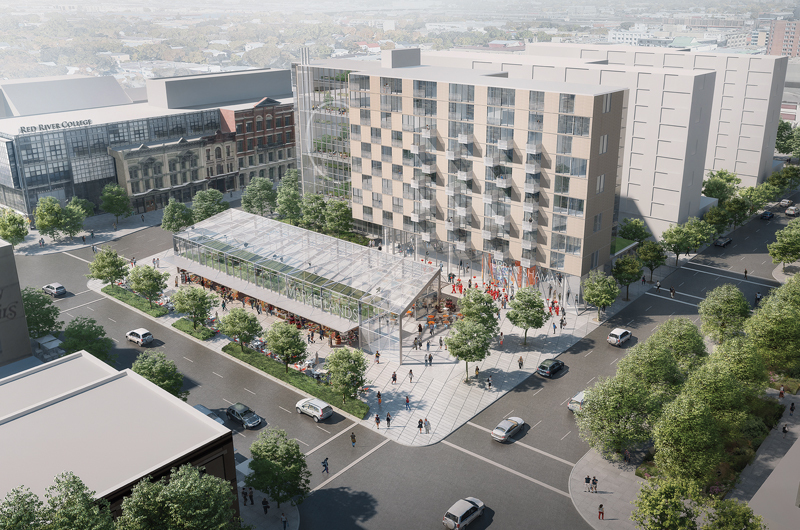 Saucier+Perrotte’s design rotated the existing triangle of Old Market Square around its apex to generate what they termed the “urban bowtie,” a dynamically angular composition that made dramatic use of space beyond the boundaries of the competition site. As a counterpoint to the nearby Cube open air stage, Saucier + Perrotte proposed a sphere which Gilles Saucier described as “a three-dimensional dot”—an open signifier standing in for a future work of public art. One criticism of earlier downtown developments was that they predominantly served that suburban population, who commuted to the city centre instead of living there. Even today, while for some the city is in the middle of a resurgence, for others that success risks displacing those who long dwelt downtown when no-one else wanted to. According to Shauna MacKinnon, chair of the University of Winnipeg’s Department of Urban and Inner-City Studies, close to 300 units of downtown’s low-cost rental housing have been demolished or sold off by the provincial government in recent years. While the Market Lands’ 100 affordable units contribute to housing equity downtown, they do not replace such truly low-cost housing. Meanwhile, the 300 units on the adjacent northern parcel will be developed as standard market-rate housing. 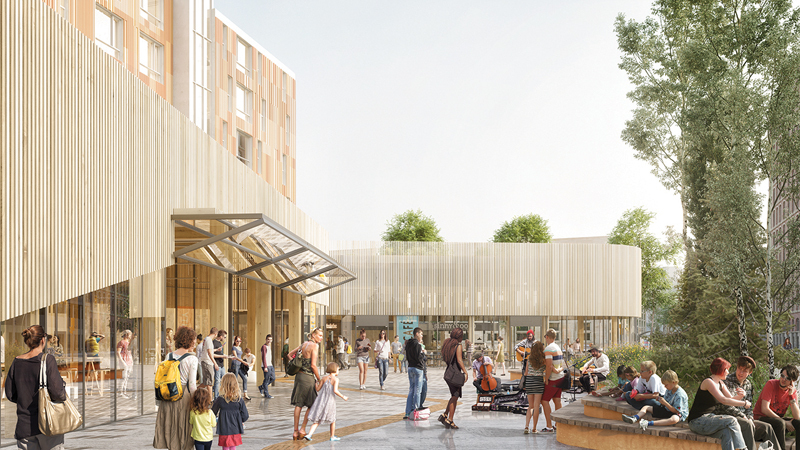 Based in part on their experience with Granville Island Public Market, DIALOG proposed multiple potential uses of public space conceived around a central “hearth.” The project integrates street activity and streetscaping with the public areas around City Hall to the east. Plantings to the south shelter the central space. 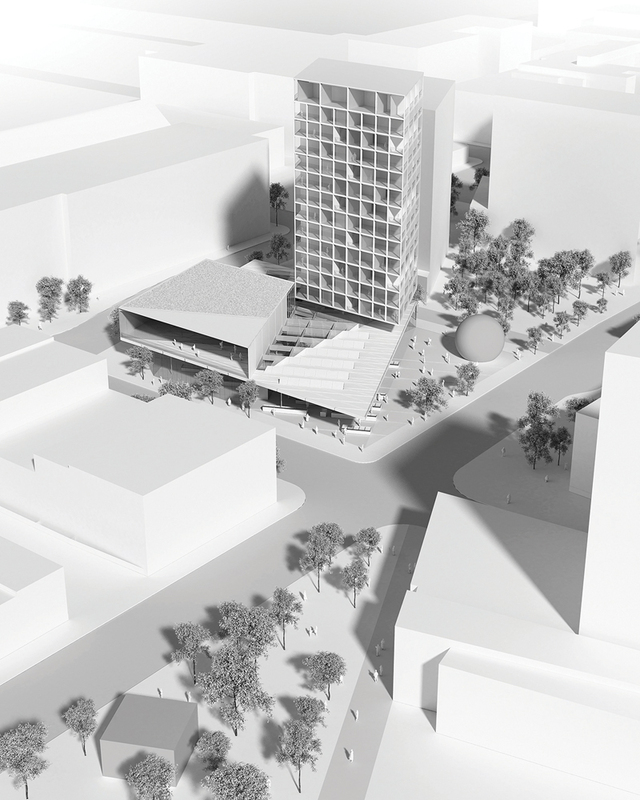 The jury raised concerns about the shading and massive presence of the 10-storey mixed-use block, which otherwise shows an inventive mingling of cultural and residential space. While the project is for all Winnipeggers, it is generally recognized that revitalization today has to also be about reconciliation. 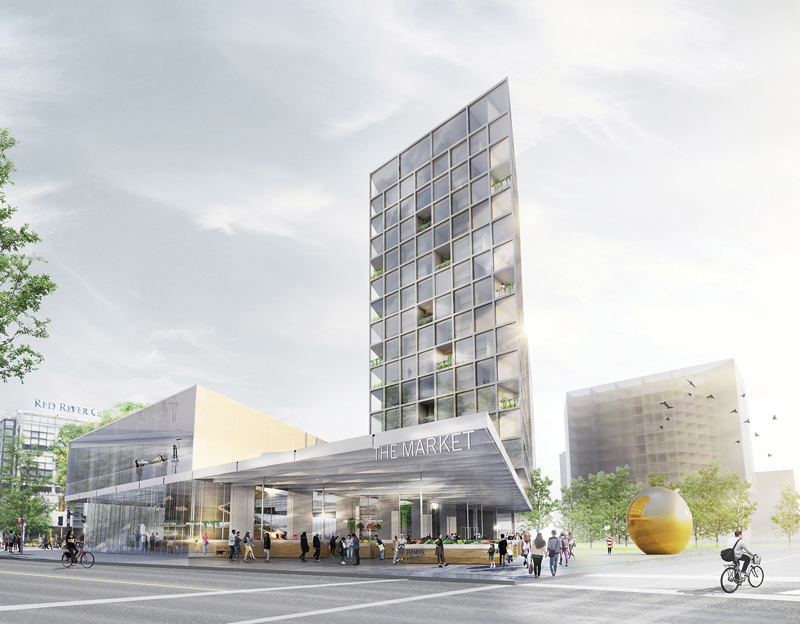 The cultural hub in particular will be geared toward an indigenous presence. CentreVenture’s intention is to attract Urban Shaman Gallery, perhaps Canada’s most respected venue for aboriginal art, as anchor of this site. The one design team with a Winnipeg architecture firm on board, 1×1/dRMM, worked with Niigaan Sinclair, associate professor in Native Studies at the University of Manitoba, to develop their project’s formal conceit, a warped grid. DIALOG carried out an extensive preliminary team-building exercise with the indigenous community. The winning proponent, Montreal’s Daoust Lestage, gave pride of place to a proposed public work by a yet-to-be-selected aboriginal artist. a cross-ventilated fresh air plenum, served at both ends by vertical gardens. 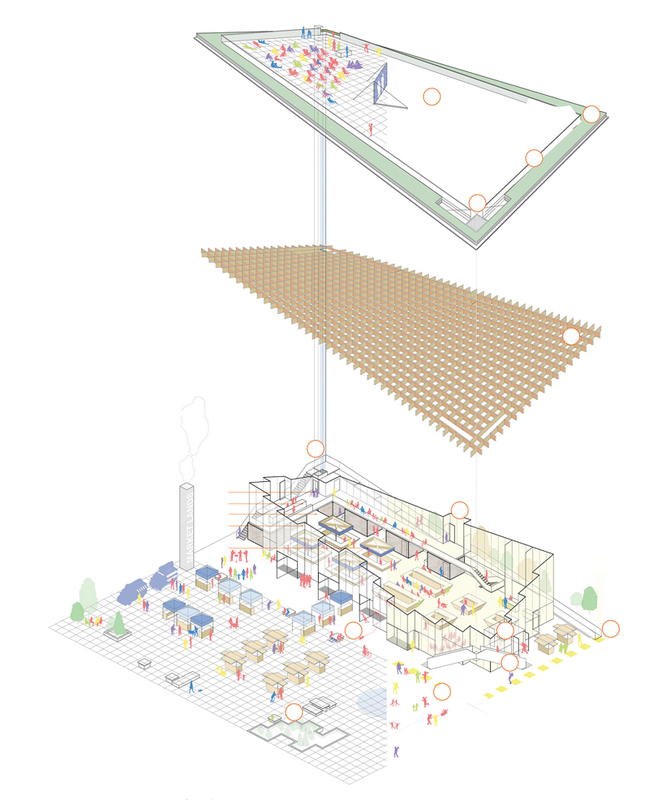 Developed with Transsolar, the market includes a suspended garden and a glazed roof with a gradation of transparency, incorporating integrated photovoltaic cells. in some senses worked against an immediate embrace of the project. 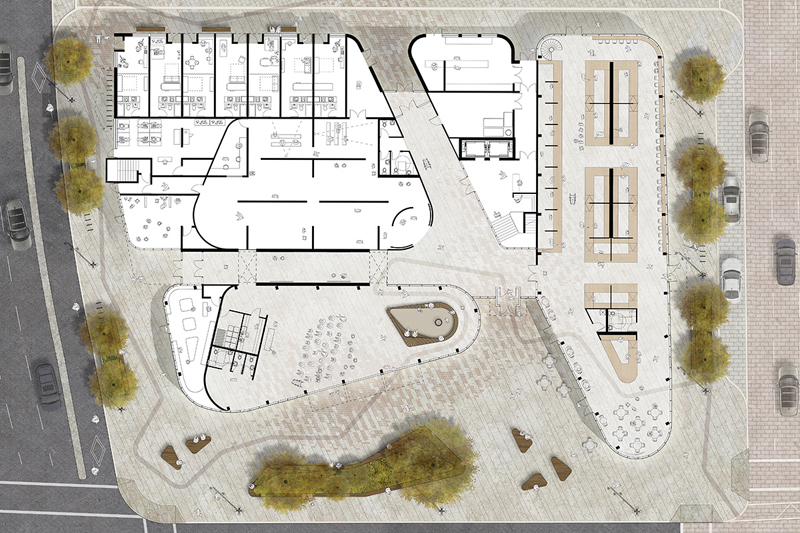 A jury member questioned whether the project had satisfied the guiding aspirations of Belonging and Authenticity, and wondered whether the site had been “whitewashed.” Daoust responded by pointing to the public art proposal, the historical grounding of the plan, and the choice of simple massing and local materials appropriate to the site. Perhaps this difficult question is really about the role of design in the creation of public space. This matters for architects now, as the public places we design must support broad-based civic and political use, while acknowledging crucial questions of identity. 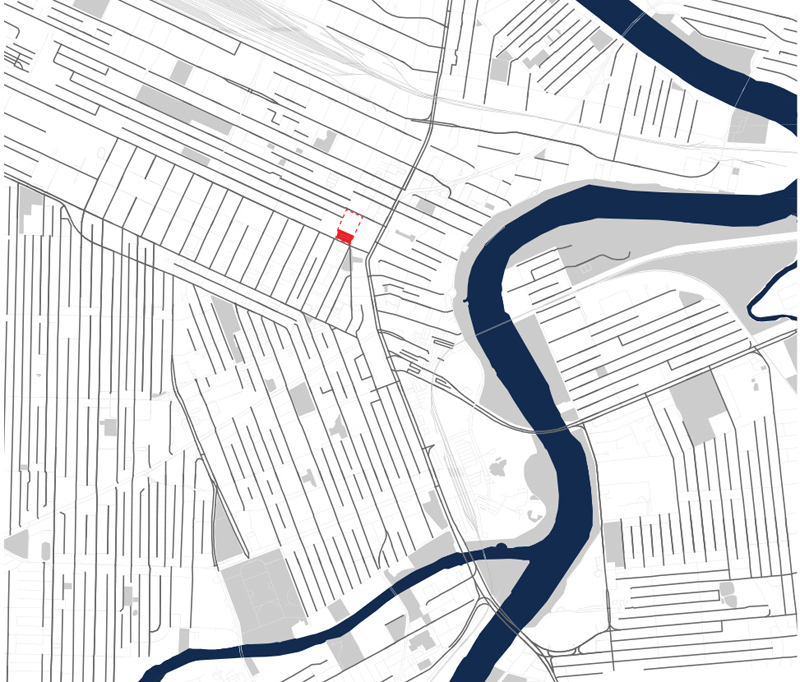 Do we design to match or cite the specificity—even grit—of a particular urban environment? Or do we create a framework within which local (or culturally-specific) social and political conditions can play out? Several of the proponents took the latter approach, and of them, Daoust Lestage’s proposal accommodates a complex program in the most pared-down and minimal form. A few moves go a long way. How well the framework functions will depend on the refinement of the design. Moreover, as another proponent, DIALOG, pointed out, the success of a project like this is as much about governance as it is about architecture. The stakes are high on this site which—as its “public use” has now shifted to culture and housing—continues to be a microcosm of global changes in cities. There are a number of tricky social programs to be choreographed as the project advances. It is a dance Winnipeg is going to want to get right as the Market Lands move from dream to reality. Lawrence Bird, MRAIC is an architect, planner, and visual artist. Bobbi MacLennan, LEED AP BD+C, provided input on sustainability for this article. Both work at pico ARCHITECTURE inc. in Winnipeg.